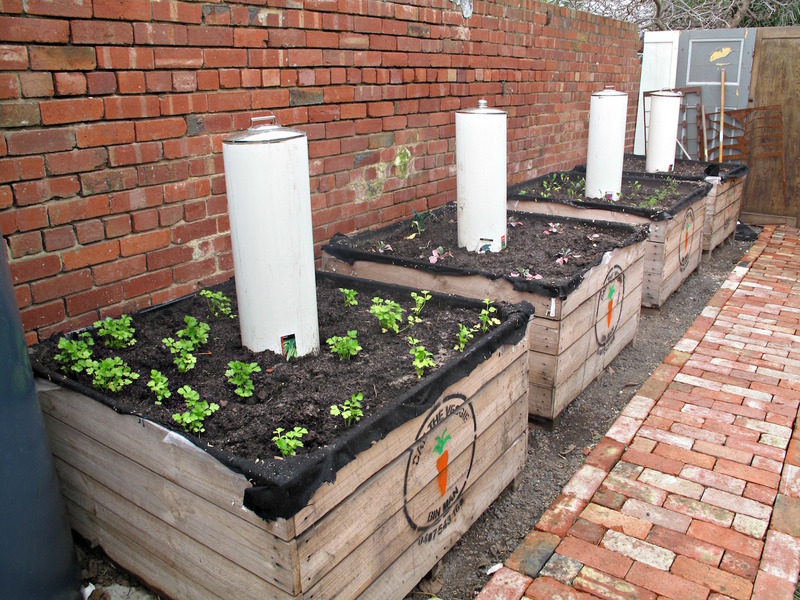 Consider The Sauce has long admired the twin rows of old shops on either side of the tracks near Seddon station, on Bellairs Avenue and Pentland Parade. We’ve often wondered what the street scenes must have been like when those shops were in their heydays. And we’ve sometimes mused how lovely it would be to see some street life returning to the area. Of course, almost all the properties concerned have been turned over to purely residential uses in the subsequent decades. And who could blame those who live there from being sensitive about and protective of their quiet neighbourhood? 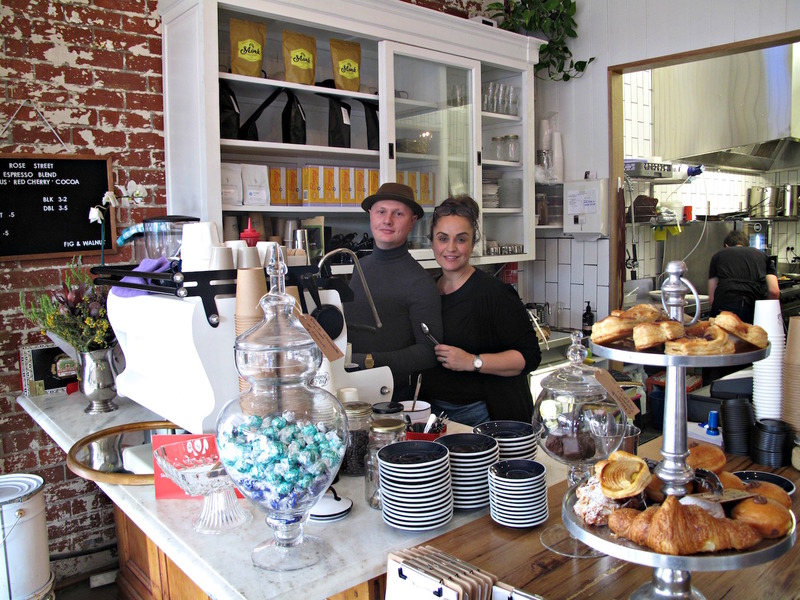 Fig & Walnut proprietor Vera told us, as her cafe was coming together, that she did indeed have to put some serious and sincere effort into winning over the locals. She did so – and I’m betting they’re all rapt about having this business on their collective doorstep. 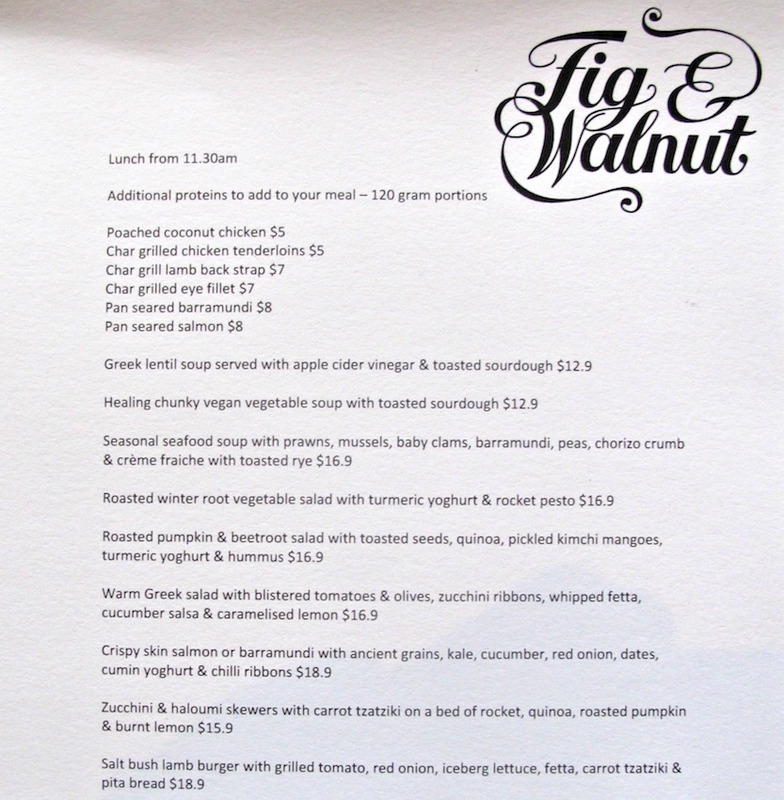 Because Fig & Walnut is a stunner. 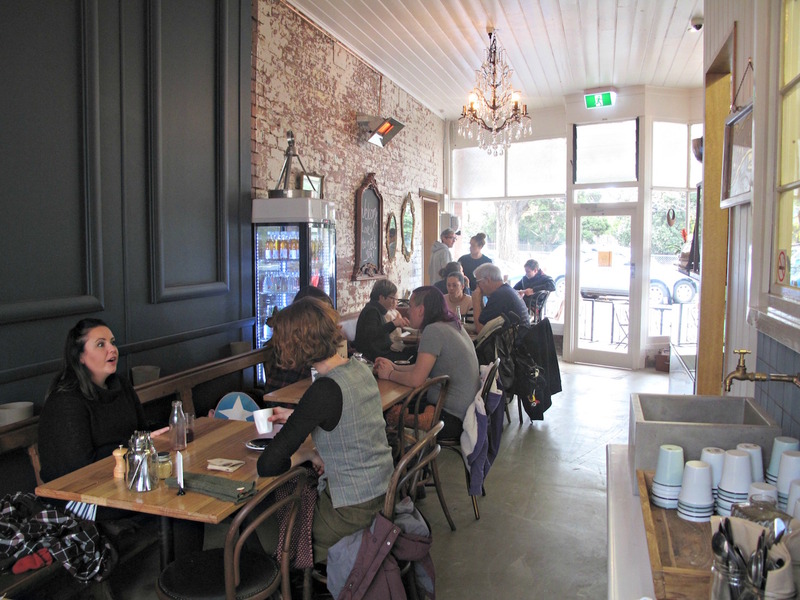 The old shop has been done out in bright and open style, with the wooden ceilings and brickwork retained. 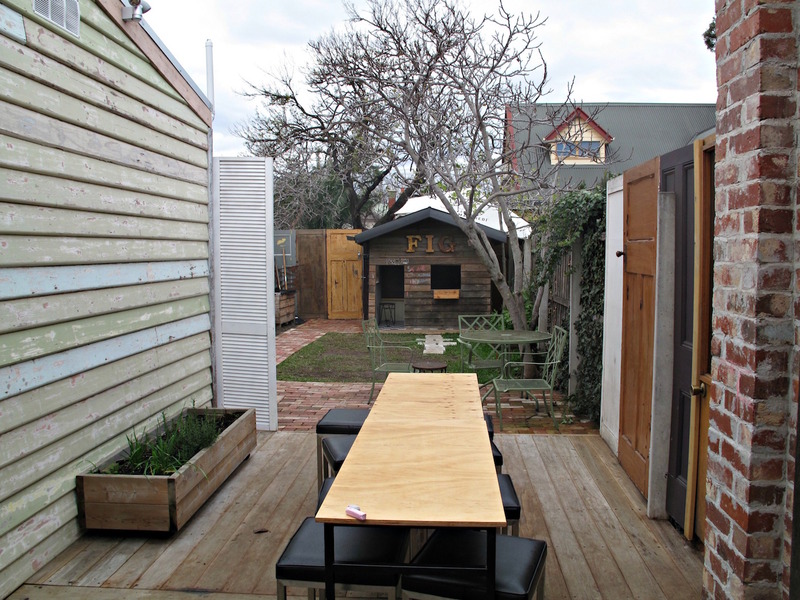 The eating spaces include the front room of the next door shop and the lovely garden out back has a cute-as-a-button cubbie house. The vibe here is bustling and cheerful. And the food, based on our first visit’s meals, is marvellous – and those we eyeball that are headed elsewhere look, some of them, even sexier. There’s breakfasts and lunches and two soups. 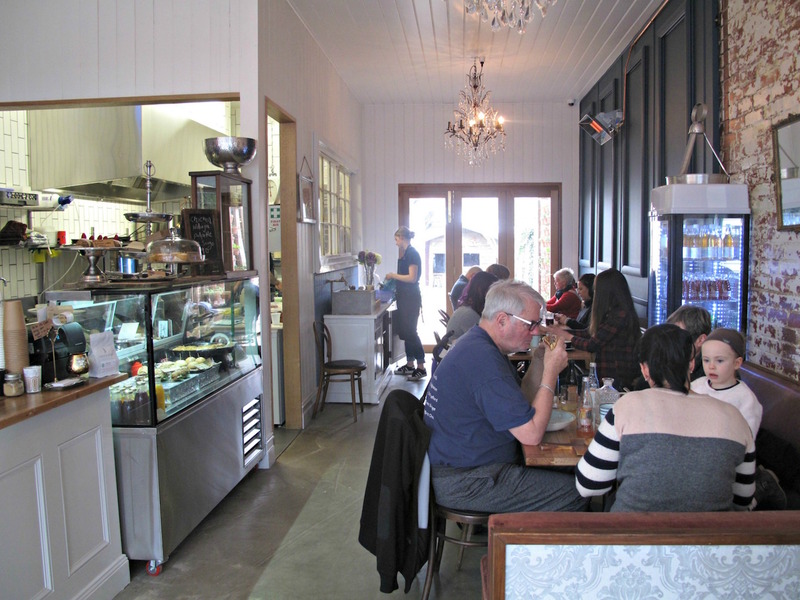 Given a superficial glance, the menu (see below) may seem to be mostly made up of variations on the cafe theme. Bennie’s pancakes ($18) are a fantasia of colours and flavours. The gluten-free pancakes themselves are shaped more like burger patties or fat cookies – and taste kinda grainy yet also marvellous. 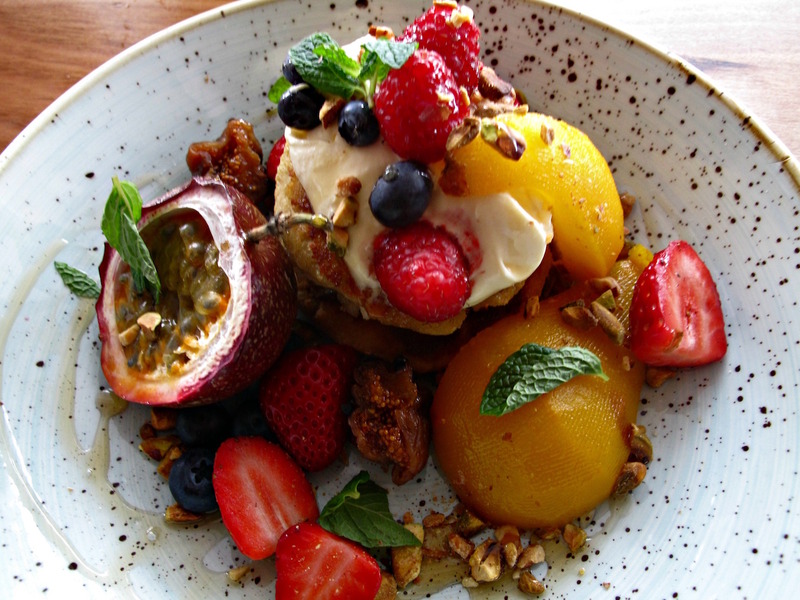 They’re attended by maple mascarpone, saffron-poached pear, grilled figs, berries, passionfruit and more. There’s three salads on the menu, any of which can be supplemented by protein portions such as poached coconut chicken, eye fillet or salmon. 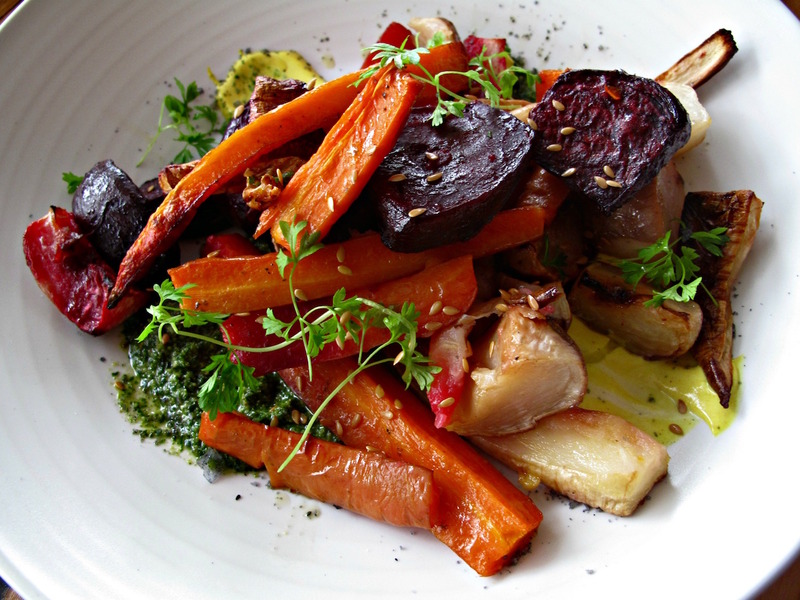 I feel no need to do so when ordering my roasted winter root vegetable salad ($16.90). It tastes even better, the perfectly cooked vegetables doing a sensual tango with turmeric yogurt and rocket pesto, both of which are delivered in perfect quantities to lube things along nicely. 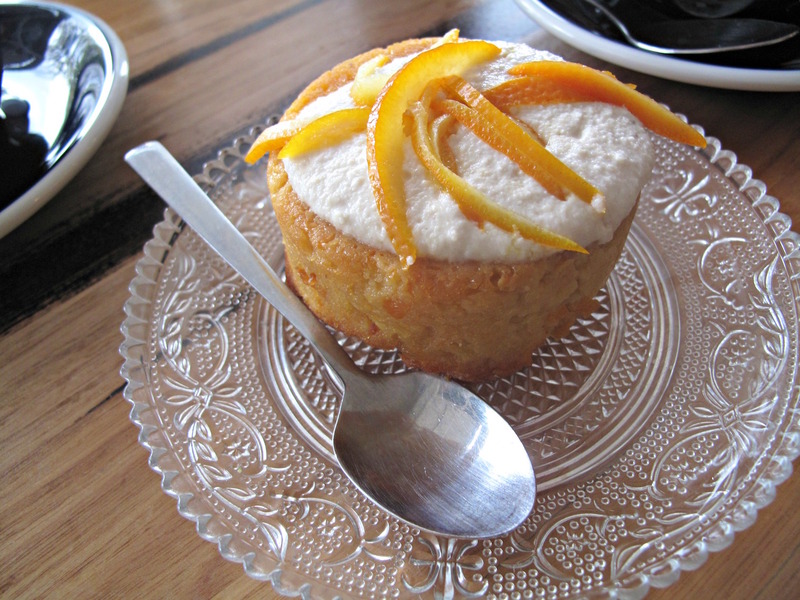 Reads like cafe food, priced like cafe food – but delivering like a flash re$taurant. 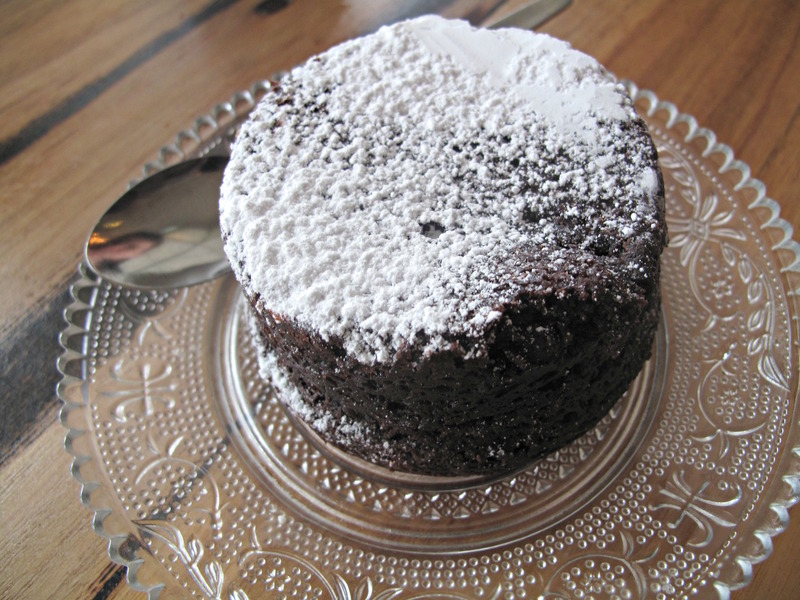 … chocolate brownie ($4.90) to go with our excellent coffees. They, too, are wonderful, the brownie seeming to have some choc pudding DNA in its make-up. The insanely gorgeous-looking zucchini-and-haloumi skewers I see heading for another table. 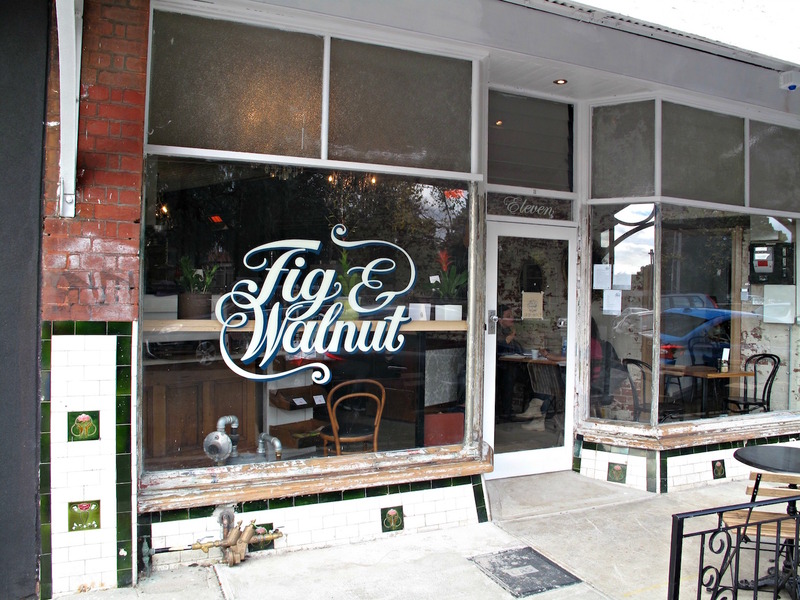 The cool Fig & Walnut logo was designed by local creative Liana Lucca-Pope from Hello Idea, also responsible for Littlefoot Bar’s brand identity. See the Hello Idea website here. There were a range of shops in the 50s and 60s for local folk. At least one bank, fruit shop, butchers, barbers, milks bars, fish and chips and a post office. 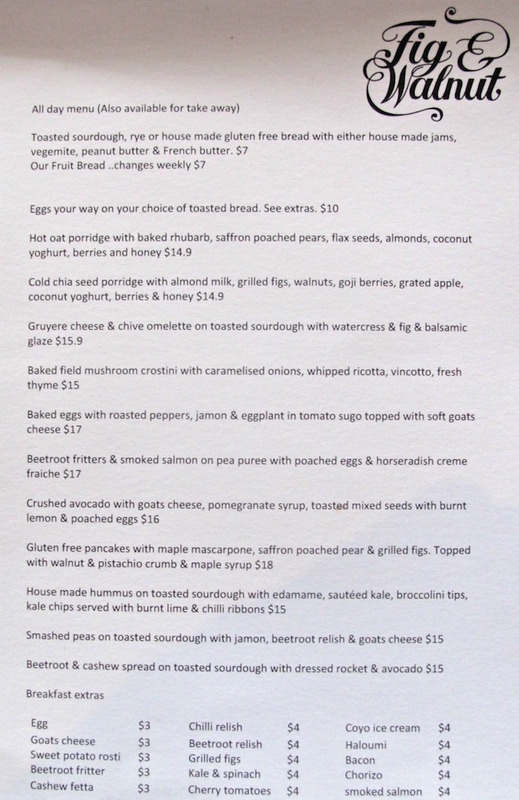 No cafes then but can’t wait to try Fig & Walnut. We hope to inspire other street traders like a barber or an alterations place …. always on the lookout for local offerrings, this one will definitely be on our To Visit list next week! thanks for the info.